Love this game! You have done really well and this feels really polished! Very clever proc-gen algorithm and pleasant movement and feedback. I noticed that there were times where I didn't have any choice but to take a route the apples that would result in my picking up a green/bad item. The visuals, sound and level generation really sells this. Great work!! EDIT: I just realised after watching the stream that you can indeed back-up in physics capable situations. I take back this criticism. This is incredibly impressive technical work! Thanks, the algorithm definitely took a fair amount of time to get something that worked well. The pickup items didn't really have any AI for where they were placed, as long as it was in an empty slot and not close to the snake's head so sometimes apples spawn near garbage, but it's not like garbage causes a failure state, just a minor setback so I didn't think much of it at the time. Yeah, if you play for long enough the camera is zoomed out so far that it's hard to see all the details. I couldn't really think of what to do at that point because I didn't expect most players to go for that long, but I'm glad you did. Enjoyed it, played for a good while, but the game showed no signs of ending, the levels were expanding more and more so I left it about 10-15 levels in. All in all great concept and it fit the theme very well! That's right, there is no end. I wrote a maze generation algorithm during the jam so none of the levels are hand-made, but it does go on forever. Well I did enjoy what I played of it and it's awesome that you developed something as complex as a maze generation algorithm that scales up so well. You should be proud of your entry! Really enjoyed the game, it was right on the theme. I love the level design that it teaches me what to do for the rest of the game within the first 2 levels. I tried to play for a really long time to see the end screen but it seems endless. I got to really big levels that I know how to solve but just didnt get enough length, which suggests that the puzzle element could be enforced more strongly. I also think you should display the number of level passed so there is some sort of recognition to what I have done in the game, otherwise it doesnt feel rewarding to pass levels. That said, the difficulty curve is great, and as everyone is saying, the quirky movement is super slick, I really dig it. Great work dude! Thanks, I'm glad you enjoyed it. I actually wrote an algorithm that generates these mazes so I didn't actually hand-make any of the levels, they are endless. The small levels worked out well for teaching the mechanic without text because it doesn't take long before you are forced to eat your own tail. A level counter was definitely something I forgot about until just after the submission deadline. There is actually no failure state, so even if you pick up all the good and bad pickups, you will end up getting gradually long enough to beat the level. The bad pickups just slow down your progress really. Thanks for the feedback. I know, that's what I realize too, when I pick up a garbage I lose one length unit but a new apple is spawned somewhere else (let say apple type B) so in fact my potential length is maintained the same (I thought of it as a length bank when I was playing haha). Then I know I don't need to worry for the garbage but focus on the apple that is actually the one that the game spawns (say type A). However 2 types of apples look the same so I got confused sometimes. Seeing through this, on one hand, lets me know that I don't have to worry about losing, but on the other hand tells me that it would just take much longer to solve the puzzle that essentially *will certainly* be solved - which takes away the urge to continue. P.S Also looking at the responses that you have in this submission page, I reckon people spent like less than 1 minute for your game? It's crazy how rushed playing game jams could be. Really enjoyed that! It wasn't overly clear on how the scoring was done or what I needed to do to pass a level, also it seemed impossible to avoid the bad mushrooms, but I couldn't really tell what they did except give you a different sound effect, did they make you shorter or something? 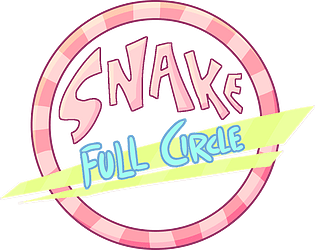 Really nice puzzle game though, the graphics were excellent and the movement of the snake was really impressive! Nice work! I tried to do more communication with visual and game design so I didn't rely too much on text. The game's design forces you to eventually eat your own tail so even if you didn't figure that out at first, you will if you try to make a long snake. Yes the garbage pickups make you shorter, but there are never enough garbage pickups to make you short enough to start from the beginning so it doesn't matter if you don't figure out what they do. Well done! I like how this game turns into a puzzle game on later levels. Also liked that you can go back a little but still get stuck in corners. Nice game! need to eat enough to catch the tail and move to new levels. would be more challenging though if the player cant move back.